A decade of fear dissolved in 30 minutes. For years I had a story that I wasn’t a good swimmer. I had another story that I was afraid of swimming in open water. I assumed that to be a decent swimmer, one had to have to enjoyed it as a child and maybe even competed. Hidden in that assumption, like Russian nesting dolls, were other beliefs: it’s difficult to learn things as one gets older so why bother; if I can’t place in a race, what’s the point. When we bond with and receive reinforcement for our stories, we can easily lock ourselves out of the world of possibility. Part of my spiritual practice is identifying my stories and investigating whether I want to keep them, alter or toss them. It’s similar to sorting through a wardrobe except that, when it comes to stories, there are always more than meet the eye. With swimming, a friend and mentor encouraged me many years ago to test those earlier stories. Readers of my blog know that open water swimming brings me joy, a reality that had been unfathomable until my mid-30s. Even after proving to myself that I could comfortably swim more than a mile in open water, I clung to another belief as if it were a bizarre life preserver. That story? Who wrote that story? Resistance. Since I so disliked having water up my nose, I was unwilling to even risk trying a flip turn. I could have left it at that, but I envied swimmers who elegantly transitioned from one lap to another via a partial underwater somersault and pushing off the wall. I wanted to claim that seamless grace for myself. A few days ago, when I realized I did not want to schlep this story into 2014, I took a private lesson. I met my instructor, Curt Colby at an indoor pool in Boulder. Although Curt trains top athletes, he is also the perfect guide for recovering aquaphobes since he meets people where they are. He exudes patience and compassion rather than the testosterone-fueled task mastering of some coaches. Like the man who taught me how to windsurf, he broke the flip turn into bite-sized pieces, a great strategy for any fear-inducing endeavor. First, he had me somersault from a standing position while blowing air out my nose. I emerged dizzy and disoriented from my underwater tumble. Water had entered my nasal passages, as I hadn’t started expelling the air quickly enough. The sensation was unpleasant, but I realized it was neither going to kill me nor stop me. Not this time! He suggested that, instead of blowing, I simply hum (with sealed lips) when underwater, a gentler way to expel the air. Next he had me lock my legs over the edge of the pool, lie back and hum with my head beneath the surface to get a feeling for being submerged upside down. With that step complete, I practiced swimming a few strokes and flipping over in the middle of the pool. I noticed that right before the flip, after I inhaled, I panicked and forgot to start humming quickly enough. Water reentered my nose. “You can do the flip turn slowly,” Curt said, eyes twinkling behind his wire rimmed glasses. Slowly? I had imagined that momentum and power were required to complete it. That, too, turned out to be a story. I tried again, relaxing while I transitioned from inhaling to humming. It felt smoother, with minimal water up my nose. By not fixating my attention on the feeling, it shrunk from a major obstacle to a mere nuisance. Just 20 minutes had passed, and I was almost ready to try the full turn. But there were a few more steps. At the end of the lane, he had me drop underwater, push off the wall onto my back with arms extended overhead, humming all the while. Completely submerged and staring at the ceiling as bubbles floated the surface, I felt like a frolicsome otter. 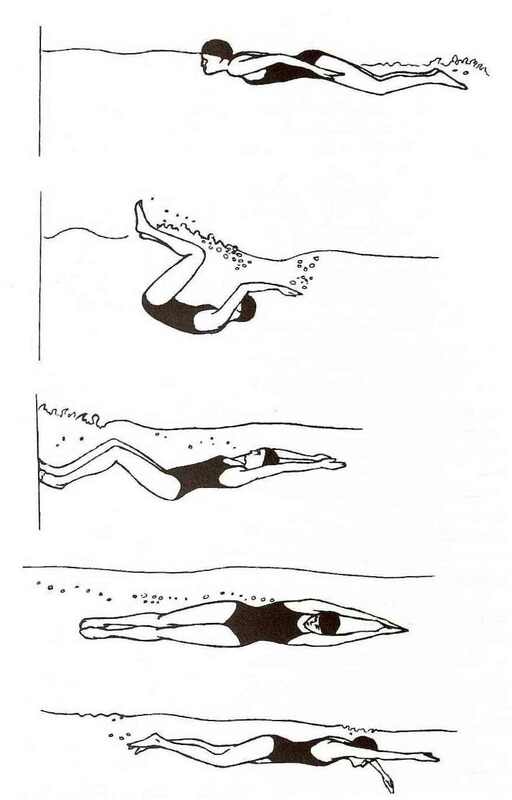 As the final step, I repeated the otter maneuver and then, mid glide, flipped onto my stomach and began swimming. Putting it all together, I completed one, mostly successful turn. I marveled that a 30-minute lesson had dissolved a decade of fear. Then, Curt’s next student showed up and stood at the pool’s edge, watching me. Feeling pressure to perform, I fumbled. “Fail!” I exclaimed as I stood up, remembering the Improv rule to celebrate screw ups. After the session ended, I practiced with mixed results. I noticed two places in the sequence where my mind periodically freaked out and I flubbed the turn. The first was approaching the pool wall. Even though the turn starts a good distance away, my breath contracted in anticipation of accidentally hitting the wall and I “forgot” to flip at the right moment. If I did flip, my mind was so surprised that I “forgot” to push off the wall or continue humming to keep my nose clear. For years, yoga teachers have urged me and others to move with our breath rather than overriding it to manipulate ourselves into a pose. I’ve often ignored this advice because it requires laser attention to subtlety and I still carry a story that I’m not patient. In the pool, however, with the risk of water invading my nose, I was forced to face my erratic breath, now a teacher with a startlingly clear insight: fear often stops me from moving forward in life (starting the turn) AND, if I do get going and achieve something worthwhile, from maintaining momentum (pushing off the wall and humming). It’s something I understood intellectually, but never at this level of the body. If we think of our behavior as a constellation of processes, then How We Do Anything Is (truly!) How We Do Everything. Modifying just one process will alter the others. I imagine that identifying and shifting those split seconds of hesitation in my flip turn will translate to a life that is more fluid, rather than lived in fits and starts. Our culture is fascinated with dramatic life changes and we’re applauded for announcing big plans and bold dreams. But when I’ve made sweeping shifts, I’ve often belly flopped and ended up treading water (or getting it up my nose!) in my supposedly “better” life rather than swimming, slowly but consistently, appreciating where I am while working towards goals. The longer I pursue spiritual practice, the more I see that it’s attention to subtleties and the willingness to welcome fear, even if that means moving very slowly, that sustains a person over time. That’s a story worth keeping, even if it lacks excitement. Thank you for your article. I have the same fear that I’m facing now – freaking out doing flip turns and being upside down in yoga are very stressful. Your article made me realize I’m not alone! Hi Adrienne, Thanks for commenting. You’re certainly not alone! A while ago I wrote about handstands…if you search my blog, you should find two posts about it. And, I’d love to know how you found my blog!